A trippy Einstein mural squirts water into the pool. But is the art-heavy new space in the Cedars anything more? The Lorenzo retrofits a 1970s hotel with an artistic smorgasbord. On a quiet Monday evening in Sep­tember, the hotel bar at the new Lorenzo Hotel is packed with the subset of the Dallas social scene that shows up for Real Housewives of Dallas watching parties. The average age runs about 48, and the attire fits somewhere between Sunday brunch and Friday night: women in heels and casually stylish dresses, plenty of eye shadow; men in striped shirts and brimmed hats, plenty of chest hair. A man who identifies himself as a designer approaches a woman at the bar and compliments her eyebrows. “I saw you on Instagram,” he says. Two photographers buzz like bees through the room, snapping photos. There is a rumor that one of the Housewives is here, though it is difficult to pick her out of the crowd. A woman with straw blond hair leans over the bar and flags down an exhausted bartender. It is not immediately clear what at the Lorenzo this evening has inspired her thematic cocktail. Is it the pink bust of Shakespeare that sits behind the bar? The pink-colored sculptural installation that climbs across the ceiling of the lobby? Or maybe it is the table in the corner of the room that is crammed with freebie bags of pink dog food? The Real Housewives episode blares on two TVs, but no one seems to be paying much attention to it. Like everything else at the Lorenzo, it is just part of the backdrop. 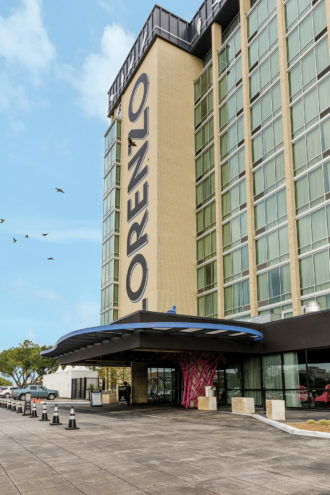 When the Lorenzo Hotel finally opened earlier this year, it was hailed as the fulfillment of many long-held promises. The former Ramada Inn, built in 1972 and purchased by real estate developer Larry Hamilton in 2006, is the latest urban revitalization success story in the up-and-coming Cedars neighborhood. It transformed an ugly, monolithic tower overlooking I-30 into a fashionable hot spot. The development was also the recipient of a sizable chunk of public investment—HUD block grants and tax increment financing (TIF) dollars—an unusual, and somewhat controversial, use of public resources that helped dress up the boutique hotel as a giant art project. The problem with the Lorenzo is that it doesn’t seem to take its art very seriously. Not that we should expect it to. It is a hotel, after all. 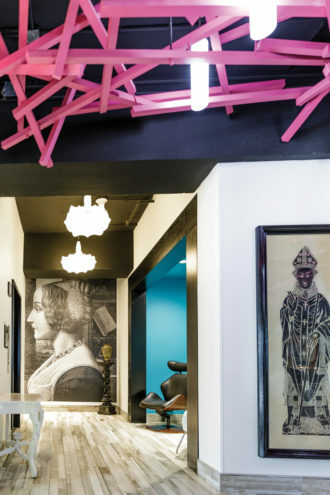 But the Lorenzo Hotel—filled to the brim with artwork, design flourishes, and cultural branding of all shapes and sizes—is also something more intriguing than a trendy, urban revitalization success story. In its own peculiar way, the hotel is a perfect manifestation of what the role of art has become in Dallas in 2017. Marketing a hotel around art and high design is itself not an altogether new concept. 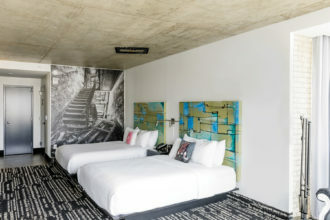 Brands like the W, Aloft, and the 21c Museum Hotel have all created recognizable identities for themselves as part of a boutique-hotel trend that stretches back to the Morgans Hotel Group’s Philippe Starck-designed hotels of the 1980s. But unlike some of these other brands, the Lorenzo offers an art experience turned up to 11. There is art almost literally everywhere at the Lorenzo. The facade is embellished with black-and-white eyeball murals, a ring of oversize silhouetted birds on a wire, and neon lights that flicker in the fashion of the newer additions to the Dallas skyline. There are also murals on the exterior walls, including a psychedelic-colored portrait of Albert Einstein—tongue out—that spits water into the pool. Local artists were invited to paint the HVAC equipment candy-colored. An annex once built to capture spillover traffic from the 1984 Republican National Convention has been demolished save a remnant of the steel substructure that is now strung with dangling colored mannequins. Inside, the art is laid on even more thickly, somehow, a hodgepodge of styles and media, including abstract sculptures, video installations, a tower of library books, Pre-Raphaelite-esque oil paintings, Cubist-ish portraits, ceilings covered in convex mirrors, wall-size black-and-white photographs of alluring empty landscapes, and more. So much more. Carpeting in the rooms, custom-made for the hotel, bears excerpts of Hamlet, and each headboard is a glossy abstract creation of a Cedars-based artist. In the basement foyer next to the parking garage entrance, there’s a proplike Egyptian sarcophagus. Photos of Andy Warhol, Salvador Dalí, and Pablo Picasso adorn the pillars of the restaurant’s dining room, and a paintbrush in a frame is adhered to the ceiling above each bed. 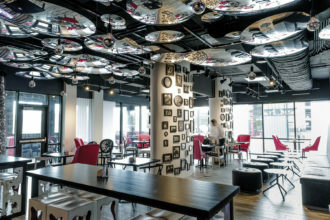 The restaurant bar features a mirrored ceiling and photos of Warhol on its pillars; Rooms come with custom painted headboards. If there is a guiding ethos to the curation, it comes from the old Dallas truism that bigger is better and more is more. Depending on one’s mood, the overall experience of it all can feel playful or aggressive, knavishly madcap or irritating and tacky. In the lobby, the afternoon before the Real Housewives of Dallas watching party, I met developer Larry Hamilton and designer Stan Abbott, who, with his partner LaRue Thornton, was the main creative brain behind the project. Unlike some of Hamilton’s other revitalization projects, early-20th century architectural gems like downtown’s Magnolia Hotel and the Dallas Power and Light buildings, the Lorenzo possesses little inherent appeal or significance. Its one historic cameo came when Tina Turner fled here after a marriage-ending altercation with Ike at the nearby Statler. A photo of Tina now hangs near the hotel’s entrance. The Lorenzo’s nondescript, watered-down, midcentury style, Hamilton says, offered an excuse to play fast and loose with the building and its contents. “We don’t take ourselves too seriously,” Hamilton says. But the problem with the Lorenzo is that it doesn’t seem to take its art very seriously either. Not that we should expect it to. It is a hotel, after all. Marketing aside, it’s not where we would expect to find ourselves moved by a jarring encounter with the capacity of human expression. But there is something in the gap between the elevated promise of the marketing copy—“Be inspired,” a recording urges callers who dial the main reception line—and the grandiose assemblage of heaps of art that, almost in spite of itself, gets at something seriously relevant to the current cultural moment. What is celebrated at the Lorenzo is not its art, per se, but rather the overall effect conjured by confronting such large quantities of artistic stuff. The art at the hotel is there to constantly remind visitors that they are experiencing the art at the Lorenzo. It is kind of an artsy fun house, filled with quirky distractions and Instagrammable backdrops. Some of it is amusing, pretty, or quite clever, while other pieces are abrasive, insipid, or forgettable. The lobby features work pulled from developer Larry Hamilton’s personal collection. It’s the idea of the Lorenzo that is the most interesting thing about it. The way it encapsulates the values of a city that prizes association with generic notions of cultural virtue—Dallas marketing itself as home to the “largest arts district in the nation” and the rest—and, on an individual level, values ambiguous creative association as an essential ingredient of a projected self-image. Yes, the art is part of a branding blitz on the part of a new hotel concept, a way to carve out a youthful or creative-leaning subset of the tourism market, just as art has always been made to serve exterior motives, political, religious, economic, social, or otherwise. But in the hotel’s reflexive, self-conscious attention to its own experience, the art participates in something new: the crafting and packaging of projected identities and the pantomime of continuous self-branding that is the grist of social media and reality TV culture. It all almost feels like an expression of a new breed of contemporary rococo, the grasping for gratifying distraction and stylized decoration during a historical moment that is otherwise defined by great political, social, and environmental angst. And so, like the episode of The Real Housewives of Dallas blaring in the hotel bar, the art at the tony new publicly funded art-centric boutique hotel mostly plays as background noise. It is all part of the stage set against which we act out our invented personae and imagined dramas for public consumption, out of fear, perhaps, that no one is really watching.